What is vintage farmhouse? Think Fixer-Upper! If you love the look that Joanna Gaines creates with her designs, than you like Vintage Farmhouse. I’d like to try to help you affordably get that look for your own home. I’ll give you some suggestions of what types of items to buy, and where to pick these items up. Enjoy! 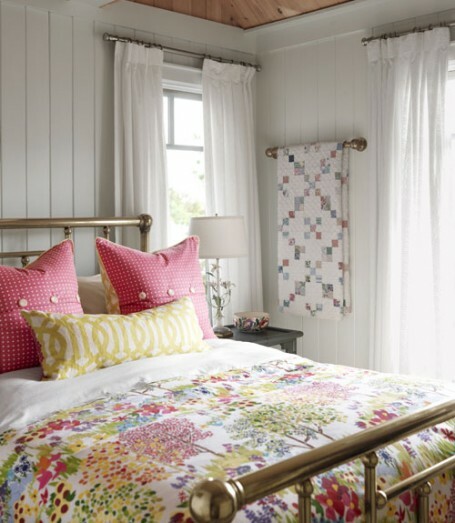 I think that the key factor of getting that vintage farmhouse look is to start with a light and bright palette. Sunlight in a room is great, but a light color on the wall will help in a room that doesn’t get a lot of sun. White walls have made a huge comeback. I remember 15 years ago we begged my dad to paint the walls in our house a color other than white. Now, fast forward to today and white is in. He was ahead of the curve:). One blogger that I love is Miss Mustard Seed. She has definitely mastered the vintage farmhouse look. Many of the walls in her house are white. On her blog she has graciously shared the name of the white paint colors she has used in her home along with other tips on decorating with white. Click on this link to find out what whites she used in her home. White is not the only color that will give you a great start to a beautiful vintage farmhouse room. Light blues, greens, yellows, grays, or tans are also great neutral colors. I’d recommend to stay away from dark paint colors. The serenity of light paint colors is one of the key features to a vintage farmhouse room. I have a blog post entitled “The #1 Rule of Thumb for picking the perfect paint color”. This post gives some tips to picking a great neutral paint color and contains pictures of rooms with some of the popular colors. I also have a Sherwin Williams Pinterest Board with almost 500 images of rooms and the name of the paint color used in each room. 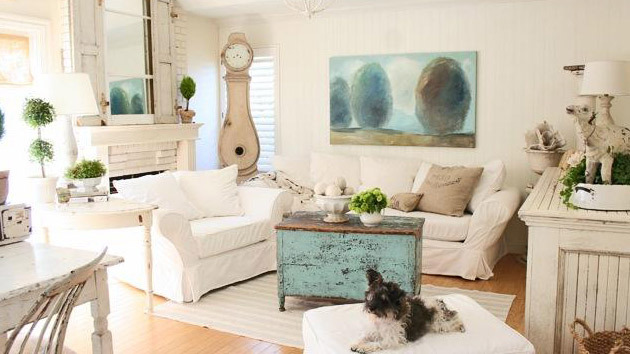 Painted furniture (especially distressed furniture) looks great in a vintage farmhouse room. White and cream distressed furniture gives you the vintage feeling of a room that has been around for centuries, but to give a pop of color, blue, green, yellow or other colored distressed furniture really brightens up the space. A mixture of both makes for a beautiful room, like the one pictured below. The best part about painted furniture is that you can do it yourself. Shop around this summer at a garage sale, consigment shop, thrift store, or craigslist to find a piece of furniture that has vintage flair or an antique look. I have a blog post titled “What to look for in a piece of furniture you’re going to paint?” to help with your selection. Don’t be concerned that you’re not an expert painter, you’re going to distress this piece, so some mistakes will give it character. Check out my painting furniture article here. While you’re scouring those garage sales and thrift stores for furniture to paint, don’t forget to keep your eye out for vintage goods. This could be an old crate, white dishes (especially iron stone), old plates, boxes, gates, shutters, windows, wheels, you name it. The older and more loved the better. A great patina on an object creates so much character for a room. Old chairs are great, especially ones with a little bit of fabric that can be reupholstered. I’d personally say keep away from a chair that needs to be fully reupholstered, because unless you have mastered this art, or want to pay a pretty penny to have it done, reupholstering is not an easy DIY project. I speak from experience. I have done it, and it was a chore. If only the seat needs reupholstered, this is generally very easy and can give you a big bang for your buck. Miss Mustard Seed has been doing a series on reupholstering French chairs. 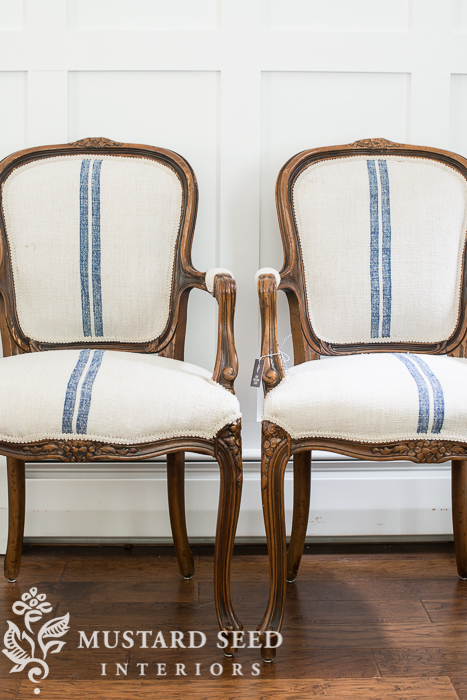 French chairs look gorgeous in a vintage farmhouse room. Below are some examples from Miss Mustard Seed’s reupholstering series. Oolala! As you have probably seen on Fixer Upper, Joanna Gaines hangs all sorts of vintage finds on the walls of the home she restores. I’ve seen her use old wheels, shutters, gates, windows, and signs. She even used an old bike on one episode! These all help to create the feeling of an old room that has been loved for years. Hit the flea market for a lot of these items. If you love the patina on an item, don’t be afraid to buy it because it’s an old window, and what would you do with an old window?? Hang it on your wall, or make it into a picture frame. This is what will give your room lots of character. Below is a room where Joanna Gaines has hung a magnolia wreath on an old window. Beautiful! Remember, as this picture points out, you can layer architectural pieces (like, shutters, gates, windows) with wreaths and the effect is stunning. Also, remember, if you can’t find it, make it! You can easily make your own wood sign. I have a DIY Decor Pinterest Board that has a lot of tutorials on how to make a wooden sign. Paint it and distress it and you have your own wooden sign that says whatever you’d like it to. Another source of wall decor, are antique plates. Miss Mustard Seed often hangs vintage plates on her walls and she displays Ironstone dishes all throughout her house. 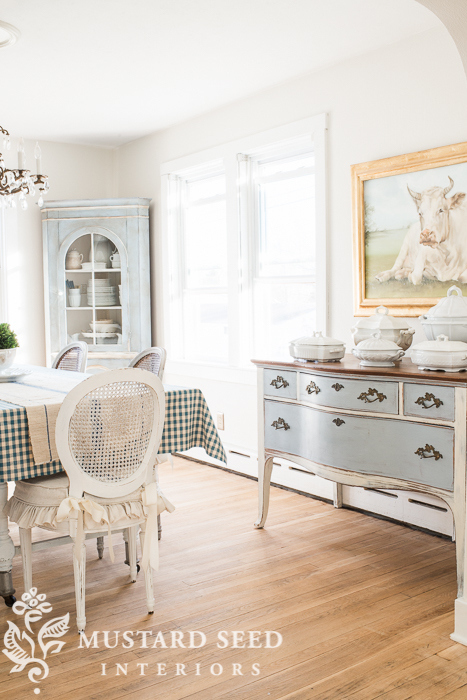 Crisp, white dishes are always a crowd-pleaser in a vintage farmhouse home. You can often pick these up at thrift stores or flea markets. Miss Mustard Seed has a blog post about hanging plates on your wall. Click here to read her post on Hanging Plates on your wall. I also love mixing and matching old dishes to make a beautiful tablescape. I almost always pick up vintage plates from Goodwill. I have a plethora of white dishes that I got for about $.50 each, so if they break, who cares! I also pick up any dishes that I love the design and I can get at least four. Putting together a tablescape with mis-matched dishes is a love of mine. I don’t get to do it enough though because our house has been so chaotic from our basement renovation for the last 6 months. All of my beautiful dishes are stuffed away, where I can’t get to them. That just helps to build the anticipation, I suppose:). Old Books are also great when decorating for a vintage farmhouse look. They can be placed on coffee tables or shelves. I have old books all throughout my home. I often place a small tchotchke on top, like a brass sculpture or wooden animal. I have picked up almost all of my vintage books and small tchotchkes from Goodwill. As I have stated above, thrift stores are a great place to find vintage items to place around your home. I have picked up so many beautiful items, but it takes some work. Don’t expect to walk into a thrift store and see a great item staring back at you. You have to search, and possibly make a few trips. I almost always find something, but I go over each shelf with a fine tooth comb. The shelves are usually jam-packed with items, so you have to really scour through them to separate the good from the junk. And sometimes, you may not find the good on your first trip. Luckily, there’s one near our house, so I’ve made many trips looking for little treasures. I have a Pinterest Board labeled “Styling”. 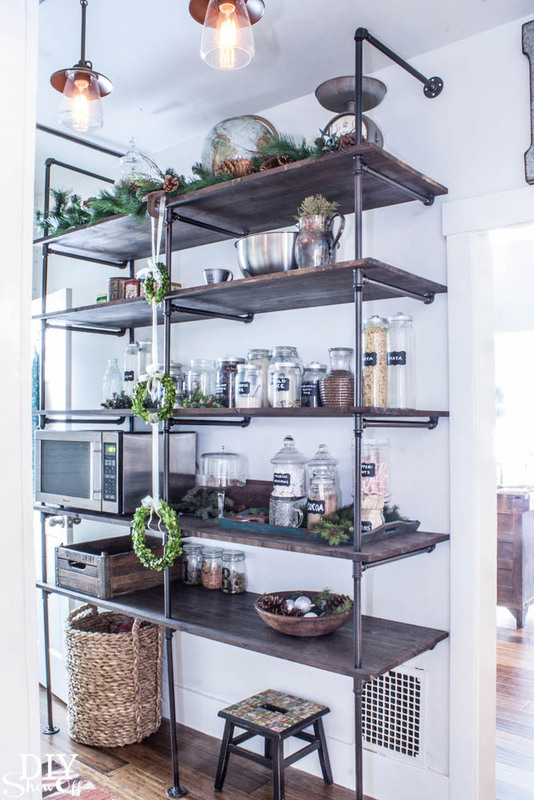 If you’d like to browse through this board, it may give you some inspiration for the types of items and arrangement ideas to use for styling shelves, coffee tables, or walls. I also have a DIY Decor Pinterest Board. This board has many tutorials for making your own home decor items. Many of these projects have the vintage farmhouse “feel”. I have found, however, that sometimes making things yourself is not always cheaper. You need to do your research before diving in. With stores like Target and Homegoods carrying such beautiful home decor items at a low cost, sometimes buying these items is cheaper than making it yourself. If you are lucky enough to have a home that has vintage character, don’t be too hasty to rip it out, or cover it up. Highlight it’s beauty! If you live in an older arts and crafts home with beautiful mill-work and built-ins, do not even think of ripping it out! Those features can be stunning. Now, some people may disagree with me, but I would paint it all white. To really achieve the look that you’re seeing on the tv shows, you need a bright space. If you notice the kitchens are usually white, and the trim is white. Light and bright is key. 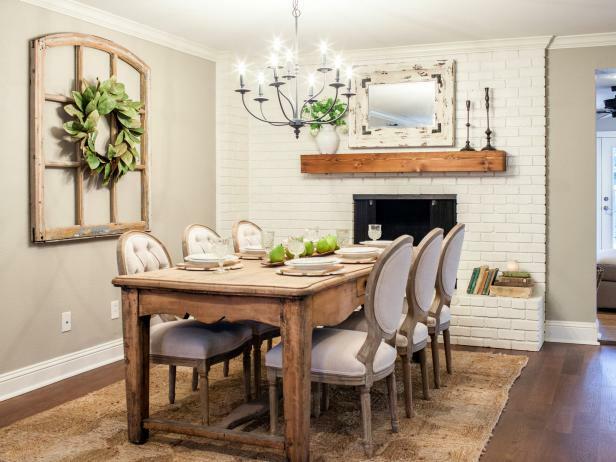 If you have an exposed brick wall in your home or you can expose brick somewhere in your house, I am jealous! Exposed brick is so gorgeous. I might also paint it white, but not always. I would paint a brick fireplace white, below are some examples from Fixer Upper of brick fireplaces painted white, but if it an entire exposed brick wall, I might leave it it’s original color. 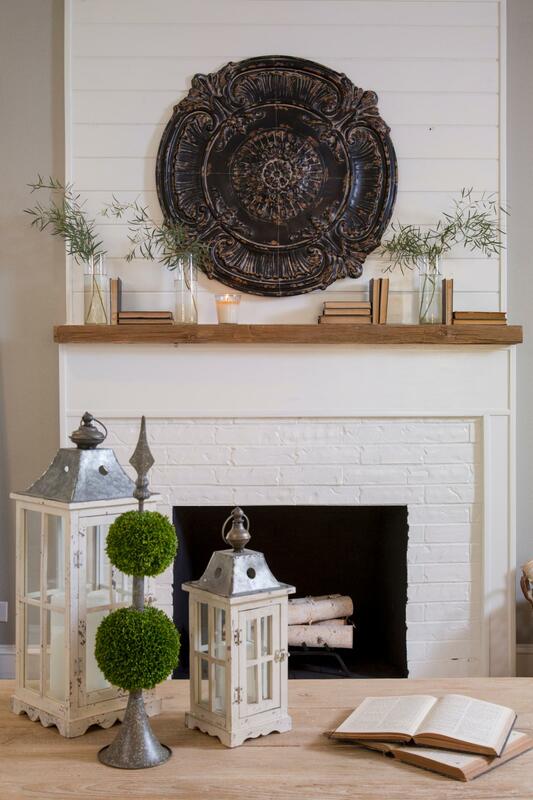 A reclaimed wood chunky mantel on a white brick fireplace is beautiful. 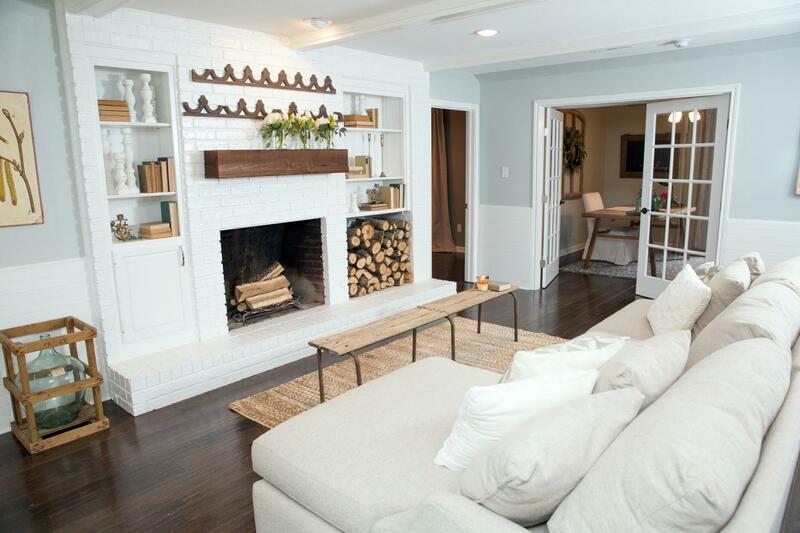 So if you have a brick fireplace, and you’ve been stuck on how to decorate around it, paint it white! It can be done. It is not a crime, just do it! First, read some tutorials though. You want to do it right. 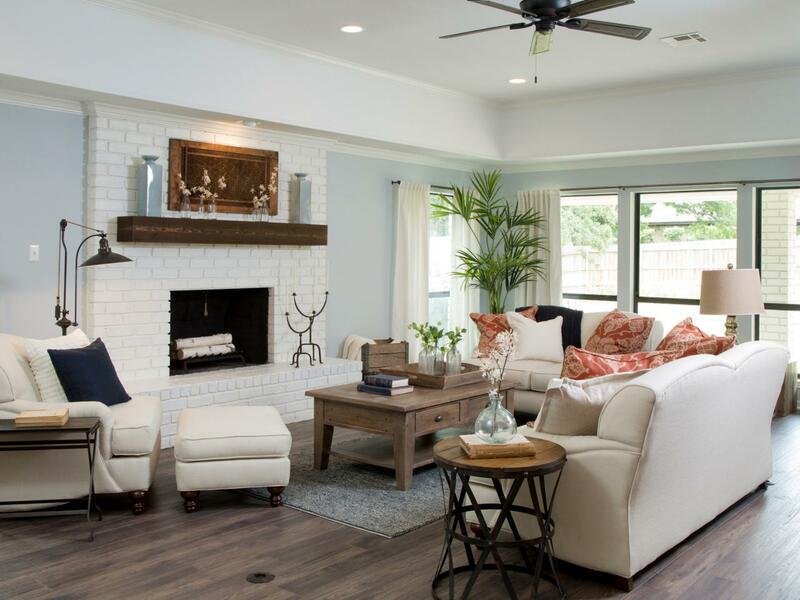 If these pictures from Fixer Upper below don’t convince you that a brick fireplace can look beautiful painted white, I don’t know what will:). 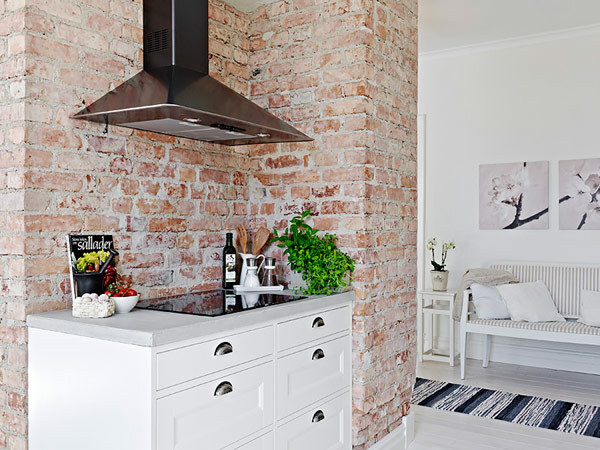 If you have an exposed brick wall, painting the other walls in your room white makes for a beautiful contrast with the reddish hue of the bricks. Below is a picture of an exposed brick wall, against white walls. Gorgeous! Now brick and original millwork are two great features in a home, but there are more that I’d love to have in my home. One thing that instantly turns people off is wood paneling. Yes, dark wood paneling can be dated, and it can make a room feel very dark, but when painted white, it can instantly give you a great backdrop for a vintage cottage room. It makes me think of the cottage bedrooms that Sarah Richardson did in her cottage. Beautiful rooms with wood paneling walls, either painted white or white-washed. They were beautiful. Below is a room by Sarah Richarson with wood paneling on the walls. I’d pay to get a feature like that in my bedroom, so if you already have a room with wood paneling and you want the vintage farmhouse look, you scored! Paint it white. Ok, so if the entire house has wood paneling, then I might remove some and put up some good old drywall. One last feature that I’d love in a home is custom molding, like wainscoting, beadboard, coffered ceilings, or chunky trim. Before we purchased our home, which is newer construction, so it lacks a lot of character, we had an accepted offer on a house that was full of custom dark wood wainscoting and moldings. I could not wait to get my hands on that house. I knew that it was going to be a beauty after I painted all of that gorgeous molding white. Now, I know, some people are cursing me. But I like bright, so for me, I wanted it white. That house ended up having a mold issue, so it fell through. I never was able to get my hands on all that beautiful custom molding, and it still makes me sad to the this day to think about the all of the beautiful features that home possessed. There is no doubt about it, white kitchens are in, especially if you want a vintage farmhouse look. White kitchens, with gorgeous white or black countertops and tiled backsplashes. If you have older kitchen cabinets that you are thinking of replacing, consider painting them white. If you watch a lot of HGTV, you’ll notice that a lot of designers keep the cabinetry in a home they are remodeling, but they paint them white. I do not have a white kitchen, so I don’t think everyone needs one, but my home is also not vintage farmhouse. If you really want to get that vintage farmhouse look, consider white! Again, light and bright is key. Ok, so I’ve spent that last few minutes hitting “paint everything white”. Now I’m going to take a spin from that. 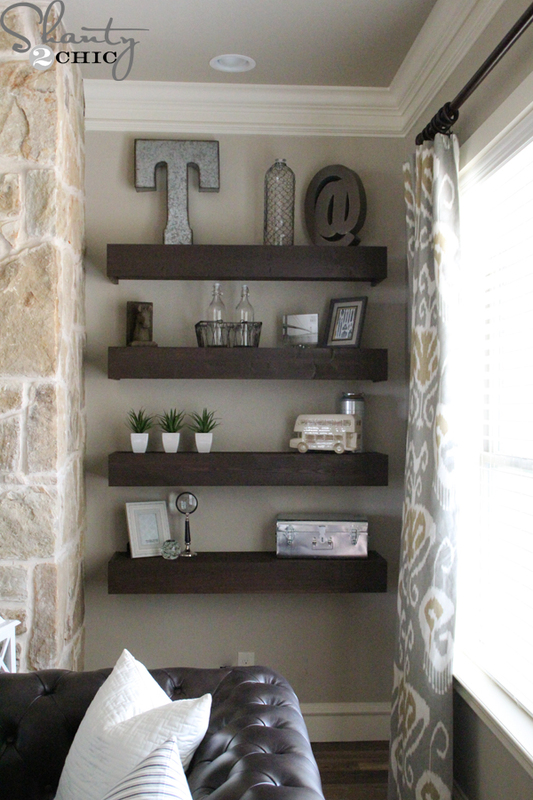 Bring some rustic wood into the space to break up all that white! You need some warm tones. Wood floors are gorgeous, but you can also bring in a wood dining table, rustic wood shelving, a reclaimed wood coffee table, or decor. The warmth of the wood tones really helps to contrast the cool wall colors and all that white. There are three websites which I have been using a lot recently to find affordable furniture, wayfair.com, target.com, and overstock.com. They have a plethora of beautiful furniture with a lower price tag than some of the popular furniture retailers. They also offer free shipping for most of their furniture. Awesome! 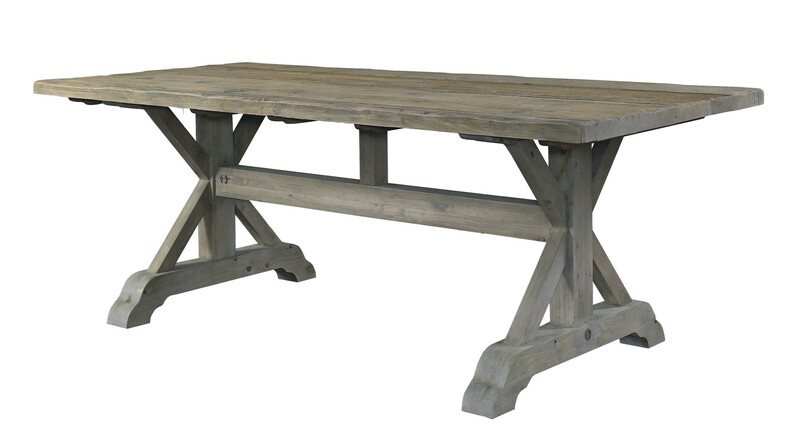 This table below from wayfair.com would like great in a vintage farmhouse dining room paired with some upholstered dining chairs. 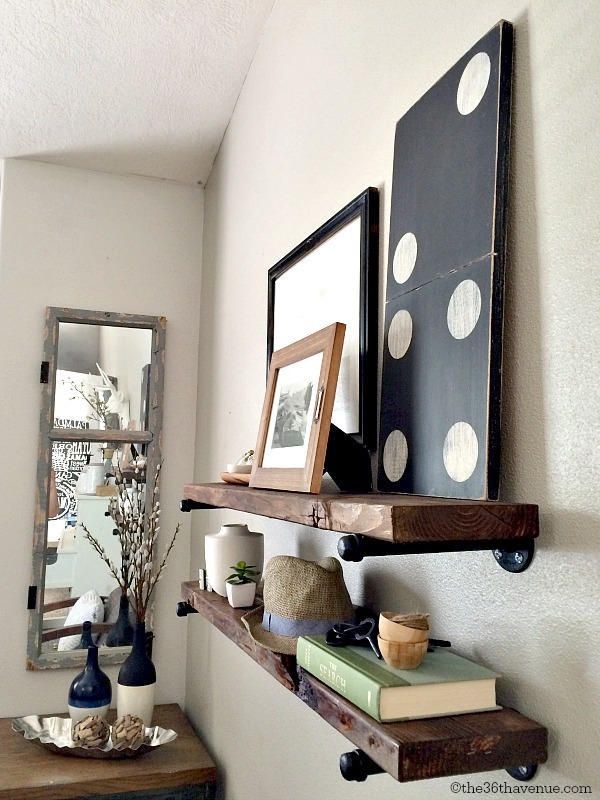 Rustic wood shelves are fairly easy to make on your own. Below I’ll include some pictures with the links to the blogs with the tutorials. I think it is so wonderful that people provide all these wonderful tutorials for us! I have gained so much inspiration through others projects. Hanging vintage items on your wall is great, but also try to include some art. 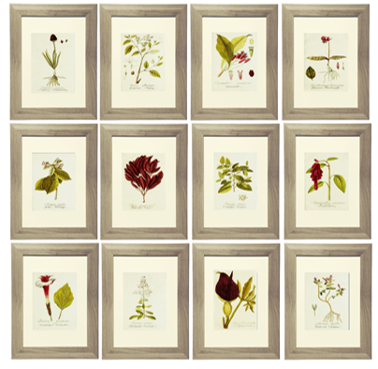 I’d love someday to have an original painting, painted by a legitimate painter on my wall, but until then I have knock-offs purchased from art.com, and to take that a step further, I have a lot of free printable art on my wall. In terms of cost savings, you can not beat that! 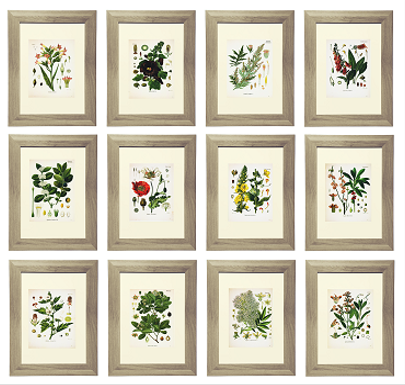 I have been putting together groupings of free printables that I think would look great in a vintage farmhouse room. I’ve even formatted them so they are easy to print. Click on the images below to open the blog post which contain these free printables. I also have noticed that Joanna Gaines in Fixer Upper has a lot of framed maps in her room and vintage architectural art. I have a Printables Pinterest Board. Here you will find lots of free printables, including maps. Maps of your local city, or a place dear to you is a great way to get inexpensive framed art with some meaning. I also have a step-by-step tutorial on printing large scale art (like maps) here. 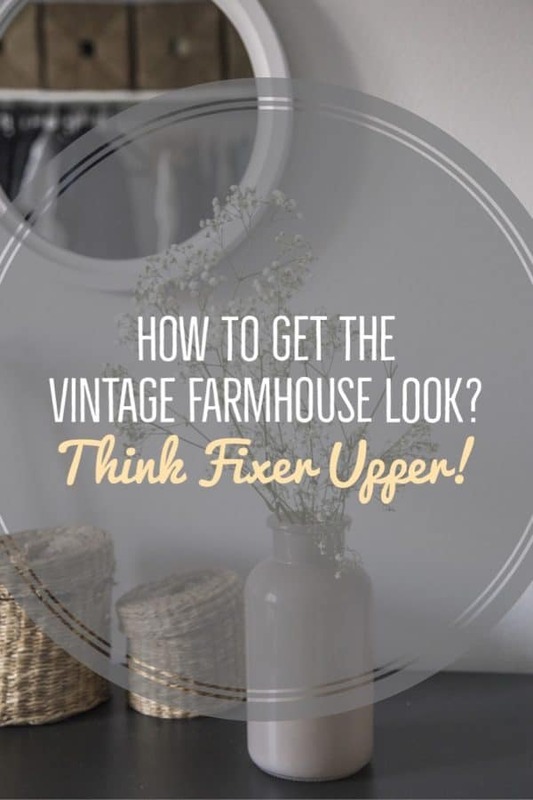 I hope that this blog post has helped someone who has been trying to get that farmhouse vintage look, or wants inspiration for DIY projects helping you along your way. Thank you for stopping by! If you’d like to see any more things that I have to share please like my Facebook page or follow my blog via wordpress or e-mail (below). If you would like to see what inspires me you can follow me on Pinterest.